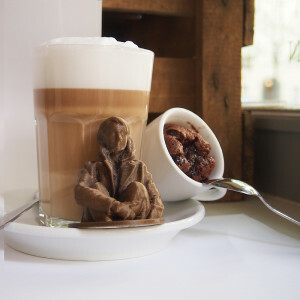 If we were having coffee, I’d whisk us to Berlin, Germany to Dimension Alley, billed as the first 3-D Printer café. That’s not even the fun part! The café features a 3-D printer so you can design and manufacture your own coffee cup, or perhaps a superhero with the face of your coffee-mate! Don’t worry. If Berlin is too far to go for coffee, these printers are coming soon to a coffee shop near you. Before I go anywhere, I’m scheduling an ear lift. Some women need face, breast or buttock lifts to enhance their (ahem) natural beauty. I need an ear lift. 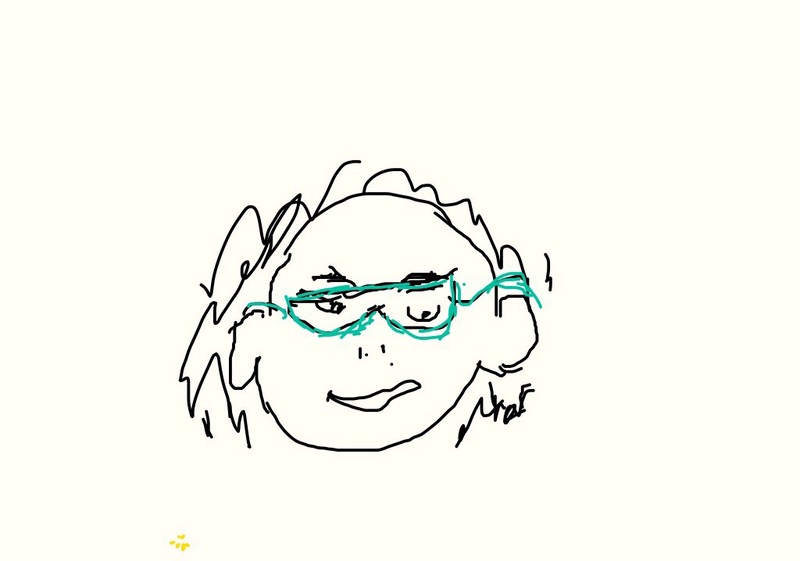 I got new eyeglasses on Monday. I used to have rimless glasses, and this sole defect in my otherwise flawless beauty – my uneven ears – was undetectable. My new glass frames are a stunning blue steel color that enhances my baby blue eyes. Unfortunately because my right ear is lower than my left, the ear pieces rest askew thus the frame cuts across my eyebrows in a decidedly crooked fashion. Hey, Sammy, Where’s your left eyebrow?? I researched ‘crooked ears’ by studying the faces of female tv reporters/opinionators, and discovered that 98.2% of them have crooked ears. Since none wear glasses, I confirmed my theory by observing their dangling earrings. Oddly, while my right ear is lower, 100% of those 98.2% – conservative and liberal yakkers alike – have a lower left ear. I wager even those of you who don’t watch news/talk tv are going to be sneeking a peek to see this phenomenon! All kidding aside, if we were having coffee, I’d bring you this nifty gizmo to celebrate our 4th of July Independence Day. Surely this lightweight, contemporary Leatherman Tread gadget will appeal to both my male and female blogging buddies because it’s – wait for it – a 29-piece tool set AND a snazzy bracelet. Each of the bracelet links contains micro-tools that perform multiple functions, enhanced by the bracelet itself which, when flattened, becomes a rigid handle to provide torque for … well … whatever torque is used for. Nah … I’m keeping my beloved handymanless Hub, but if you single ladies are searching for a Handy Hub, you might give some serious thought to wearing this bracelet laced with micro-tool pheromones! 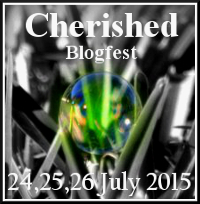 Don’t forget to sign up for the upcoming fun-filled, easy-peasy Cherished Blogfest! Details can be found at Co-Host Extraordinaire Dan’s site. Lastly, I’m going to spend part of my weekend re-reading Sue’s Travel Tales of Life blog. Sue and Dave are on a high-adrenaline biking, hiking, climbing and sea-faring adventure to Machu Picchu and the Galapagos. You can catch up on her thrilling stories and drop-dead gorgeous photos by clicking on her blog name. A truly joyous adventure! 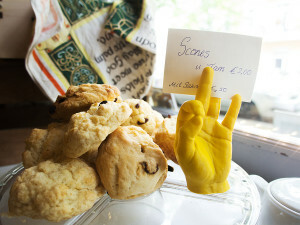 I love the thought of that cafe! How cool…now I’m going to put the news on and check out everyone’s ears……lol. I have little(ish) ears that stick out 😦 I was so self conscious I didn’t leave the house with my hair in a ponytail until I was in my 30’s!! Awww I bet your stick-out ears are cute! Whose ‘ear genes’ did you inherit? Raqi’s ear stick out – from the back they look like you could snap ’em off 😀. Fortunately she doesn’t notice; besides they are exactly like her Dad’s and her brother’s, both of whom she adores! This was a fun post. I think I might print a mug that had grooves for my fingers, instead of a handle. Thanks again for the shout-out. I was worried when you started talking about lifting things – I thought I might have to pretend to have been off-grid for a day. 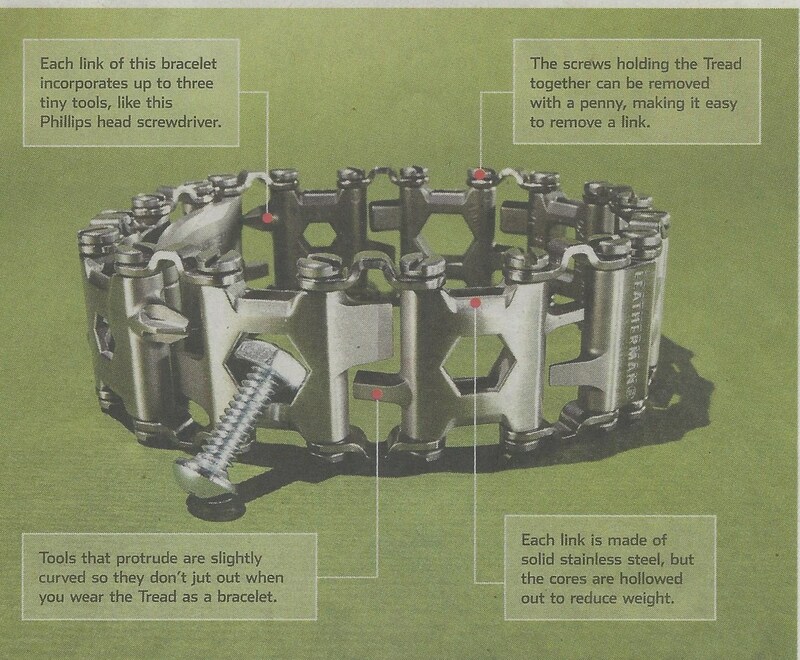 Two questions about the tool bracelet: 1) how heavy is it? Heavy enough that if you wear it regularly, one arm will be longer? 2) what kind of tool gizzmos are in it? Ha! So noted on the derth of lifting help. Bracelet weighs 5.9 oz (is that a lot for a bracelet?). The video of it in action is fascinating. Sorry. Her bracelet was shipped yesterday. Sammy thanks so much for the shout out! We really appreciate it. Hope you enjoy the weekend and have some laughs with us. All the very best! You bet! Enjoy your weekend. BBQ this weekend? Enjoy the fireworks! It seems you could fix that glasses problem if someone were to sit on them just right. That always left me with one side riding high, which in your case should straighten things out. Thanks fot the tip, which worked previously. I did exaggerate my crookedness, so I’ll live with the look. At some point we all have to give up illusions of physical perfection. You realize, of course, that I’m going to have to study everyone’s dangling earrings now to see if their ears are level. 🙂 Those 3D printers are really neat. The local high school has one, and my son is chomping at the bit to get into that class. I need to catch up on the Machu Picchu trip. Hopefully, later today. I am also chomping at the bit to see one of those 3D-ers in action. Denver’s main branch has one so I plan to zip in there this summer to watch someone using it. I am flabbergasted by what we will eventually be doing with it. I also read that some Lowe’s Hardwares have them to make things for customers. Just mind-boggling. The thing about those newscasters is they typically hold their heads still so you get a long enough glimpse head-on. I can just see you on the street grasping women by the shoulders to face them squarely then instructing, “Don’t move.” As you seemingly gaze intently at their …. I totally want to go for coffee with you – you find all the best places! 😀 Berlin it is then! Thanks, Laurel. I’m left wondering why you didn’t just go for new rimless glasses! Oh and here’s a link to zentangle street art in London – well I think it is a zentangle, see what you think! Cool!! I figured it was only a matter of time – I’ve seen tangles on walls and shoes but not yet any outdoors! I say that too but only when no one’s in listening or reading distance 😀. Because my natural beauty needed more distinct framing than the rimless ones gave me. It had ABSOLUTELY NOTHING to do with the frame covering the bags under my eyes. Oh, Sammy, I’d LOVE to have coffee with you. We’d talk forever! 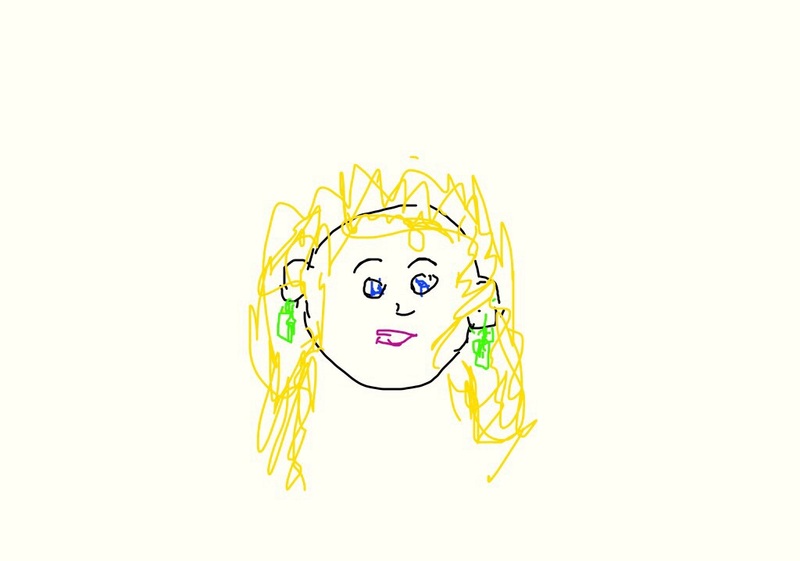 Love your drawings!! My ears are even but the one on the right sticks out. Apparently when I was a baby I slept with that ear folded over. You’d think someone would have fixed it. Mom? ?Now I’m craving some tea. Wish I had a scone to go with it! Just another in the long list of ‘Mother Did Me Wrong Blues’ – letting you sleep on your side and now you are permanently traumatized !! I have electric blue, two-tone glasses and I love them! As long as I have to wear them they might as well be stunning. I think my ears aren’t even either but they were able to do some easy adjustments to make my glasses sit right. Maybe you can 3-D print a slightly higher ear for your right side. What a GREAT idea!! *head slap* Why didn’t I think of that !?! Oh my … having coffee with you is so interesting and so much fun!! Hey, how’s your bike riding going? I’ve done a few but cannot get back in the habit of routine workouts of any kind. I’m very frustrated with myself about it – it’s been this way for over a year. I don’t know why I’m so stuck in this one area. I have been spinning indoors and today was my second ride outside … 2 hours. It was really sloooooow. I’m in a pretty deep hole from a cycling fitness perspective and a long way to go for next year!! No, that’s good!!! I, too, am going very sl-o-o-owwww and I’m wiped out after those 2 hours. But I am focused at every curve and looking for every pot hole so I feel much more comfortable while I am riding. I cannot afford warrior crashes anymore, so duffer speed in case of a duffer spill 😊. And you know what? I’m doing it, and I can say I did it. Who cares how fast or how many breaks? 😀. The good thing is now that I’ve confirmed even natural beauties like us are asymmetrical, i’m less harsh on myself about the outcome of my artistic attempts. If God created us in His image and we’re not perfect, why should I expect my own creations to be? Thanks, as always, Joey, for being here. I think I have uneven ears too, as my glasses are always askew. Never thought of this as the reason why. Interesting. I know!! I guess they are dropping in price so more places are getting them. I plan to go to Denver’s main library – supposedly one there patrons can use. I’ll watch someone! So cool. I know my husband will be all over that if it comes around here, lol! I’d love to see one of those printers in action – amazing! I just can’t conceive of how they can make so many things out of one material (layer upon layer) like a gun that can actually shoot but is all from that layered material? I gotta see it to believe it!! Thanks for the giggles, Sammy. I was in need of them.